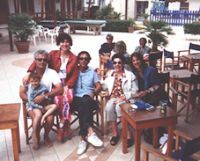 Stephanie's dream was to take her mother, Norma, to the seaside village of Viareggio, on the Tuscan coast, where her grandfather had lived. She could recall his passionate stories of working as a seaman, and dreamed of visiting the spot where he once had lived. Stephanie's top priority for her Italian trip with her mother was reconnecting with family roots, but she was overwhelmed with the details of making that happen. My resources led me to a wonderful quaint hotel right on the promenade with every service they requested and an open door to the people and culture of the seaside. You see, Norma could speak and write Italian fluently and was welcomed like a long lost relative by the small seaside community. The Italian adventure was such an enormous success that Norma now wants to live in Viareggio six months a year. "My Italian dream trip was to go back to Italy with my mother and visit the area where my maternal ancestors were from. As a child I heard stories of Torre del Lago, the magical leaning tower of Pisa and the sleepy seaside village of Viareggio. My biggest challenge in making this dream come true was lack of time and resources. Being the mother of 2 active children, finding the time to research a trip of this kind was overwhelming. I was referred to Ginger from a friend and from the moment we connected, I knew my dream was going to come true with her support. Ginger listened to what we wanted to do and worked her magic to make it happen. She researched the area even finding stories of the history of Viareggio where my great grandparents and relatives had lived and worked. She found the perfect accommodation for us to stay for 9 days where we could really absorb the culture and the people. She gave us suggestions for day trips and I was able to visit the places I had heard so many stories about as a young child. We were even able to find a distant cousin! My mother & I had an unforgettable experience connecting with that part of our heritage. It was such a pleasure working with Ginger. I highly recommend her to others wanting to plan their Italian dream vacation. " Stephanie and Norma make new friends in Viareggio, Italy.